I love cherries. Cherry pie, cherry cheesecake and even cherries straight from the bowl. 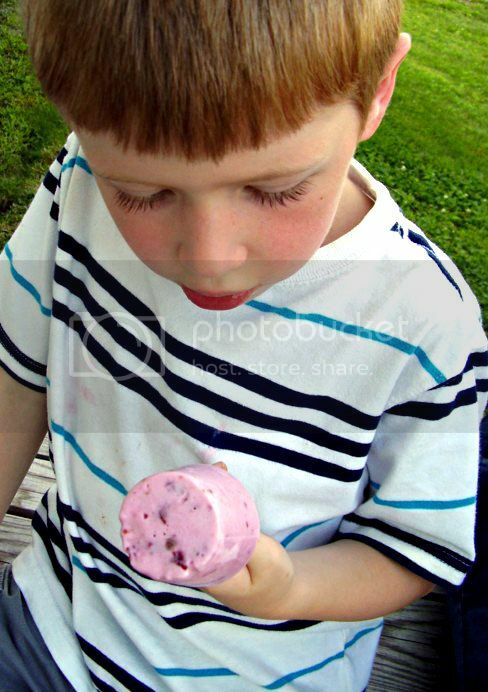 Our boys also love all things cherry, and these yogurt pop treats are a new family favorite. 1. Put all ingredients except cherries in a blender or food processor and mix well. 2. Cover and freeze for approx. 20 - 30 minutes or until very cold, but not frozen. 4. 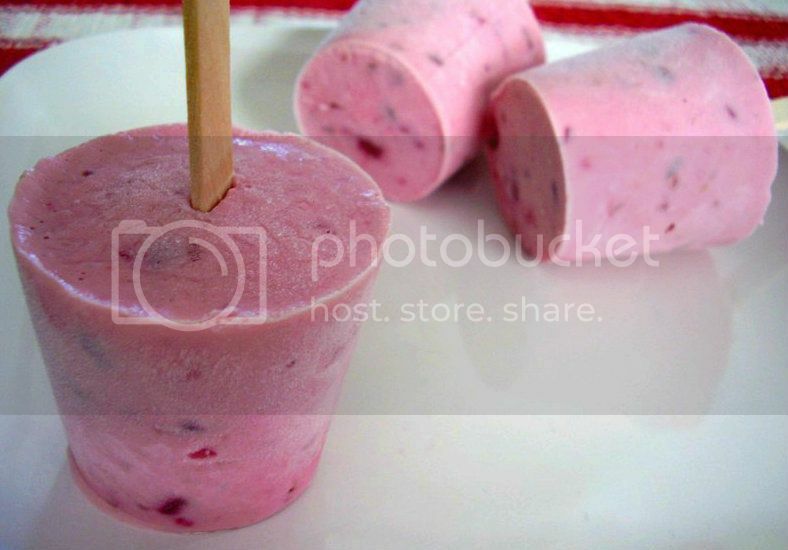 Spoon into popsicle molds or 3 oz. disposable cups. Some of the yogurt mixture did not make it into the cups at our house! I caught someone helping himself to a yummy treat. 5. If using disposable cups, freeze for approx. 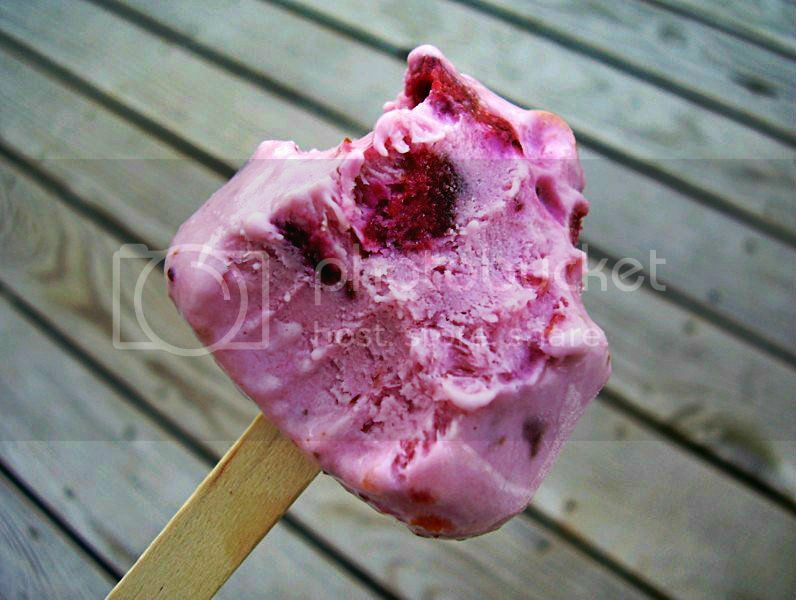 45 - 60 minutes, remove from freezer and insert popsicle sticks. Return to freezer and freeze until firm. I think strawberries would be delicious, too! You could also use one tablespoon of lemon juice instead of the cherry juice. Mmmm this sounds really yummy! I'll have to try it out. thanks for sharing!! These look amazing! But your son's face is priceless as he is enjoying them! That looks delicious and so much fun! these look fantastic! I wouldn't mind to have one right now! These look SO GOOD!! YUM! I am going to get supplies at the grocery store!! Thanks for linking up to TGIF! If you have a moment I'd love your vote in Circle of Moms Top 25 Homeschooling blogs (http://www.circleofmoms.com/top25/Top-25-Homeschooling-Moms-2012) - Thanks!! I agree, Mindy. Making them was just as much fun as eating them! I think we will be using the disposable cups for popsicles from now on. :) The boys loved helping and it wasn't too messy. This look wonderful. Great summer treat. My family would love this recipe. Come and visit us. We are having a flip flop giveawy. They are so cute. Wow, these look amazing! 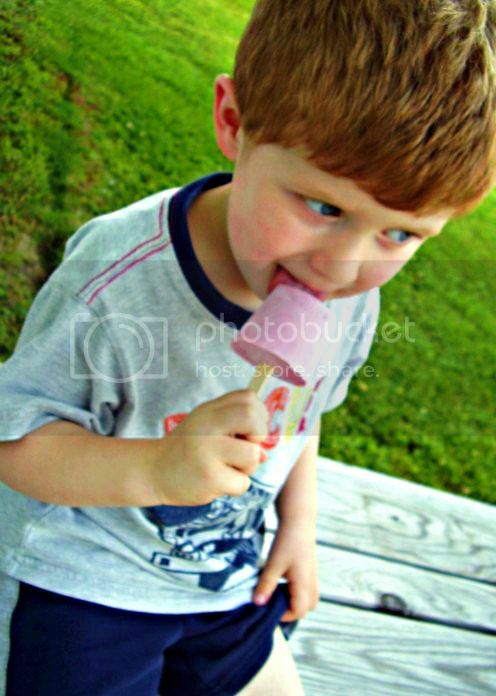 I've been on quite a popsicle kick lately, so I've been pinning them like crazy. Thanks for sharing! Looks like your boys had lots of fun making them. They look delicious and sound perfect for summer. Gonna have to try these without the cream cheese! Oh WOW! I could almost taste this looking at your gorgeous photo. LOVE this recipe. So glad you linked up at Weekend Potluck but did I miss seeing a link back? =) This is perfect for summertime. They look so yummy! I can't wait to try them especially with the weather so hot lately visiting over from Country Momma Cooks Link and Greet. What a wonderful summer treat! I can't wait to make these for my kids :) Thanks so much for sharing at Mix it up Monday! This looks amazing and just perfect for the summers. Would love it if you link it to Piquant Potluck! Yum! These look delicious! This is the perfect treat for summer and I can't wait to try the recipe. Thanks so much for linking up to Creative Thursday last week. I can't wait to see what you link up this week. Have a wonderful weekend. What a great summer treat! I bet you could use any flavor of yogurt and it would be awesome too. I would be so grateful if you would join me at my new link party; Mom's Library! I needed another recipe for my cherries - awesome! Thanks so much for sharing at Mom On Timeout! These are a must for me to make this summer! They look amazing!!! Im a new follower to your blog and would love for you to visit mine! Anonymous, I used nonfat yogurt with these and they were still delicious! These sound delish!! 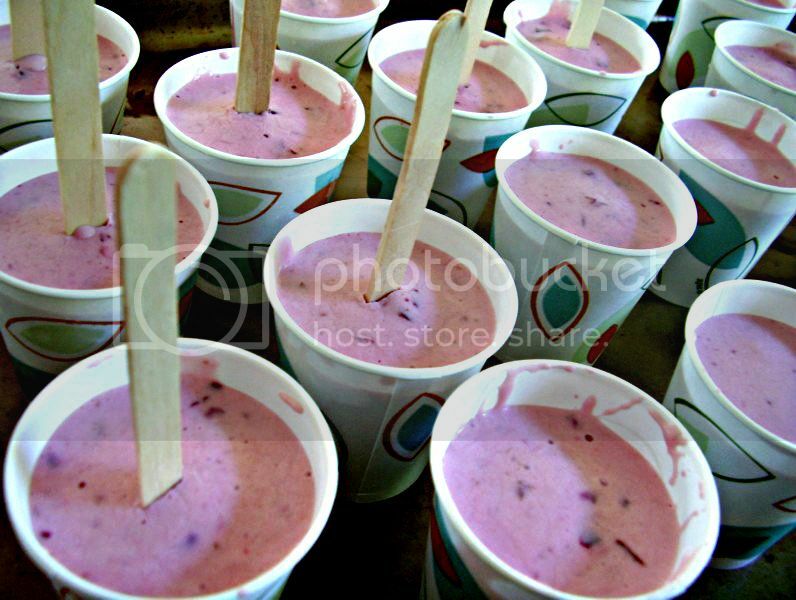 What a fun refreshing treat for hot summer days! I am featuring them at todays link party!! These look delicious! I am happy to let you know that you are being featured this week over at Addicted to Recipes. Come on over and grab your button! found you through the link up for Country Momma Cooks - hope to see you at my blog! Great recipe! Looks so delicious! 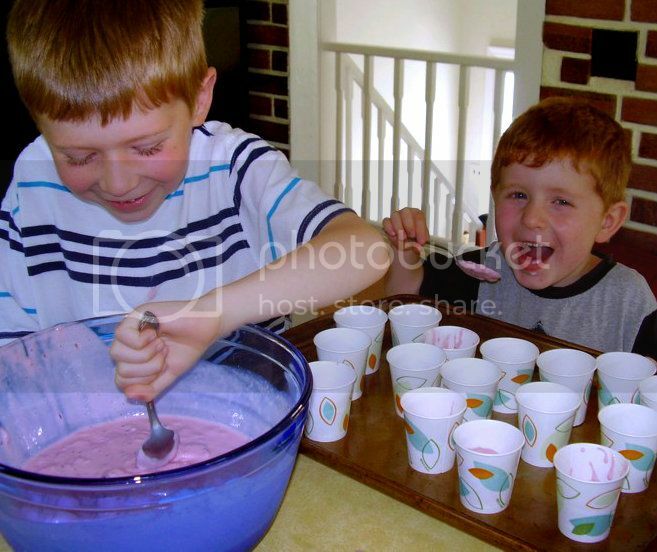 Very clever recipe and fun for the kids! What a GREAT recipe! Looks like your kids enjoyed helping and tasting! Sharing on my Walking on Sunshine Facebook page today! Thank you for sharing with Foodie Friends Friday! Please come back on Sunday to VOTE! G'day! LOVE the flavor combination! GREAT summer fun food dessert! How fun! I can't wait to try this with my son...thanks for sharing!